that is such a great color on you- and i love the casual flats! cute! that zara bag is so pretty! what a lovely dress, Krystal! Love these dresses that you have with that are just a big block of gorgeous colour. So nice! I LOVE that dress!!! The bag is super fantastic as well! You look beautiful! My denim jacket has always been in circulation! I am dying over that tote!! this is such an amazing look! I LOVE the dress! The whole outfit is amazing! Stellar outfit as always! Especially like the chains and the shades- it's the details that make the look! I think I am slowly warming up to the idea of jean jackets - I haven't owned one since high school, but they seem to be everywhere right now! I still don't own a jean jacket though I've always liked the look of fitted cropped ones in the summer. Love how you put yours over the bright orange and I am still jealous of your gigantic tote! Orange looks great on you! Also, your hair looks fab...it always seems to curl perfectly and look "just so". Such a perfect little outfit...I love the gold paired with the orange and also the little bit of sparkle on the sandals. I'm afraid my jean jacket is still hiding in the closet...too cold in the UK! Love the orange and those sandals are simply cute. love your dress and sandals! I never gave up my jean jacket! It's just too comfy and versatile. Casual and comfy outfit! Makes me want to go for a summer holiday!! Team spirit or not, the color of that dress is awesome and looks great on you! And yes, it's fun that jean jackets have gotten the green light again this season. I love the denim jacket over your bright orange dress - so gorgeous! I love your orange dress! That tangerine shift dress is such a cute color on you! Love the dress, beautiful color! I love this look! I did really put mine away it's so sad :( now I have to go buy a new one. Yay for baseball! I'm not a Giants fan, but I am a pretty big Brian Wilson fan. I'm so sad that he is out for the season! I absolutely love the orange! Love the look and the dress! I love it - Congrats! Love the color on you and how casual you made it with the flats! You look so great in orange! And those sandals are just gorgeous. I love that color on you!! I'm totally loving that on you. The glasses and sandals are perfect! 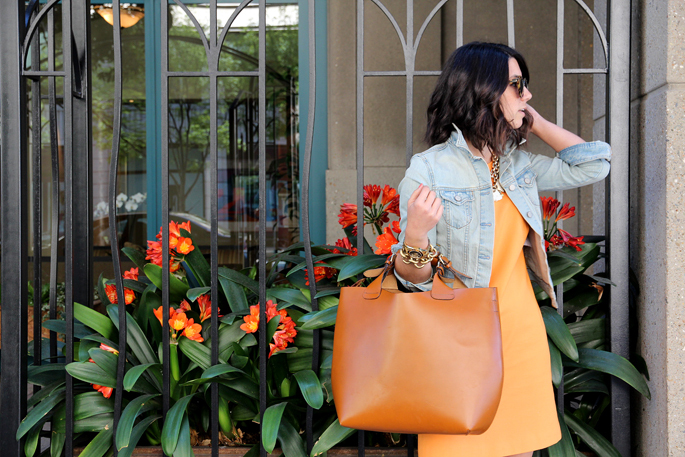 Perfect spring combo-- orange & denim. super gorgeous love the dress!!! I love my Old Navy jean jacket - mine is a darker denim. would love to pick up a lighter wash! I've been searching for a dress like this for ages!! I always await each of your posts miss. Keep up with your impeccable style and wonderful ideas! If you need something to read have a look on my blog as I give 50 % off on some reading positions and at the end of this week my first Trust-Ka-Shop will be launched. Great dress. I need to have this Zara bag, it's awesome. haha funny you say that about the denim jackets. I had put mine away I don't know how long ago. It was in such a safe place, I couldn't find it myself for ages. Good news is, I was sorting out the attic yesterday and came across it. It still fits, still looks good so I'm working it back into my wardrobe. Perfect for over summer or maxi dresses when it gets chilly right!? If you like bags, check out some great bags from a brand I came across in a london market on my latest post. I adore this. Love the shoes and bag! Thank God Vogue has given me permission to wear my jean jacket again. Can't even tell you how many hours of sleep I lost over this. I love this outfit and I am particularly inspired by your denim jacket. I have a jacket just like this one and I had it in a bag to donate, but now I am reconsidering. I have had it forever and have not worn it in ages, but now I have some ideas. I really love how your jacket looks with your dress. Cute, bright, fun outfit & I LOVE your hair! beautiful outfit. must get my hands on some karen walker sunglasses. i seriously love the bag and the orange :) sigh i wish it was sunny over here!! Love this look. So simple and at the same time so stylish!!! Great combination of colors!